In this guide, I’ll show you EXACTLY how I worked through every single step in The Overpaid Writer’s 3-Year Career Blueprint. This ebook covers everything I know about freelance writing. Every year, the internet offers a host of new ways to work from home and make serious money. Writing is one of these ways, and it’s one that has withstood the test of time and technology. If you can write well, you will ALWAYS be able to find work. Most writers work for between $5-$10 per article. They learn to write mediocre quality articles very fast and end up making around $12-20 per hour. Some of the more exceptional writers can find gigs paying around $50 per article. Why do I make so much more than most online writers? I know WHAT to write about, I know WHERE to find high paying gigs, and I know HOW to land those gigs. Finally, I know how to write the types of articles these high-paying employers want, and I’m looking for a few committed individuals to train in these methods. Do you have what it takes to earn $400 per article writing online? If that describes you, you’re eligible for the following offer. For a limited time ONLY, I’m offering my complete guide to 6-figure writing for just $18. 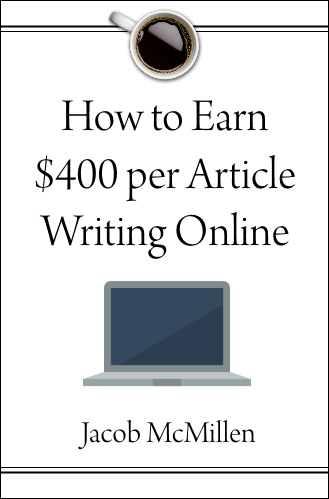 You’ll receive a step-by-step guide to making $400 per article as an online writer. No hand-holding. No phone calls. No fluff. Just the gritty details. “In this guide, you have put out more concrete actionable steps than over 90% of the “experts” have in their materials. You’ve made all of this information direct, to the point, no b.s.” – Kay H.
Imagine Making $2,000 Per Month Writing Just 5 Articles! How Would That Change Your Life??? You’ll have to work for it. This isn’t free money. But who wouldn’t want to earn 10x the minimum wage working for themselves? Imagine never clocking-in again. Imagine never having to deal with office politics. Imagine never having to worry about paying rent again. There are MILLIONS of people earning a full income from home. I can teach you do it more efficiently, more effectively, and more profitably than 99% of them. My name is Jacob McMillen. I’m a writer. I’m not a celebrity. I’m not an Instagram star. I’m a normal dude who makes a full-time living from home without working full-time hours. I wake up whenever I feel like waking up. I take my time getting breakfast & coffee (I’m all about that coffee). I spend an hour or two writing an article, earning between $400-600. I eat lunch and watch Netflix with my wife. I spend some time working on my personal hobbies. My wife & I go to the gym and workout. We come home, cook dinner and eat together. I spend an hour sending out pitches to new clients. My wife and I have a fun evening. That’s a typical day. You may notice that only around 3 hours are required to actually do work. The beauty of self-employment is that you are flexible. This last year, I made 5 figures in November and took off most of December. This isn’t really a “get rich” lifestyle, but if you’re the type with millionaire aspirations, you can always apply my methods to a 50-hour-per-week lifestyle and get rich. I personally prefer to make a solid income without working much. Are you ready to turn writing into a “real job”? And all of this for 1/10 the price of a single gig!?! ?